The Abegweit Conservation Society is a collective of passionate individuals dedicated to the beauty and health of Prince Edward Island. We boast a strong conservation ethic and work tirelessly to integrate this ethic into Island consciousness. The Society values and nurtures the natural interconnections between land, sea and air. We develop, implement and support preservation, protection and enhancement programs to benefit our cherished land. An arm of the Abegweit First Nation, the Abegweit Conservation Society is a Canadian registered charity focused on the protection and conservation of Prince Edward Island’s natural resources. Founded on a 10,000-year Aboriginal history of nurturing our land, water and air, we empower Islanders and Island communities to steward our precious environments. For millennia, nature was a one-stop shop for our people – our pharmacy, our clothing store, our supermarket. Although most Islanders no longer source what we need directly from our environments, our need to sustain and protect them remains strong – not only for ourselves but those who will come after us. 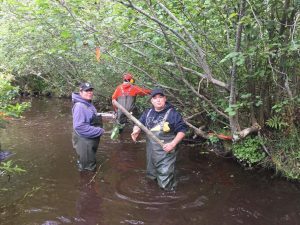 Through the efforts of the Abegweit Conservation Society, an overarching body reflecting the interconnected nature of the environment, all Islanders benefit from the strong cultural ties between the Mi’kmaq people and nature and from the traditional knowledge collected through the generations. While we greatly value the traditional wisdom of our ancestors, we also realize the incredible worth of science in our work. That’s why we insist on an ecosystem approach to conservation. Stewardship is a frame of mind. Together we can change our collective perspective on nurturing, protecting and enhancing our environments for future generations.